On the contrary to most of the other buying guides we’ve published, the present one is more of a “wish list” or a “dream list” rather than a proper guide – so consider it a guide for those who already have everything they need but want to be genuinely surprised. Nothing here is rational, it’s all about passion, ingenuity, creativity and impressive mechanics. 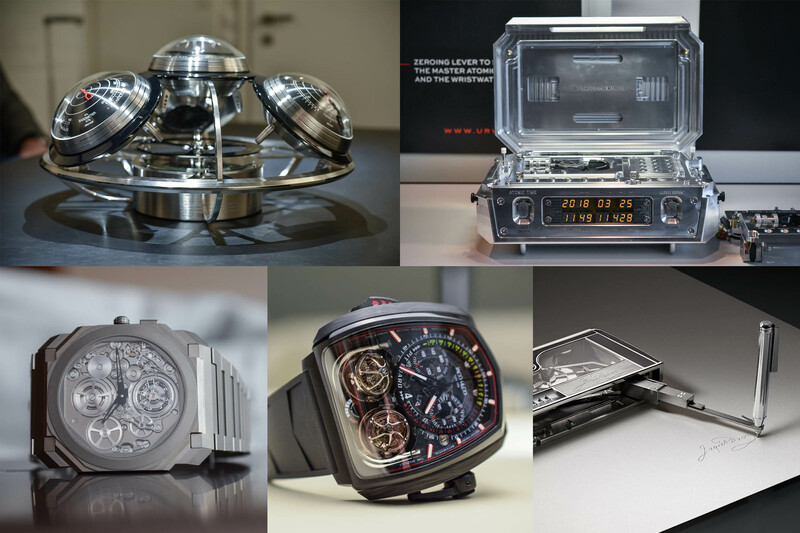 From the thinnest automatic watch ever created to a signing automaton or an atomic sympathique clock, here are the five most marvellous mechanical creations we’ve seen at Baselworld 2018. 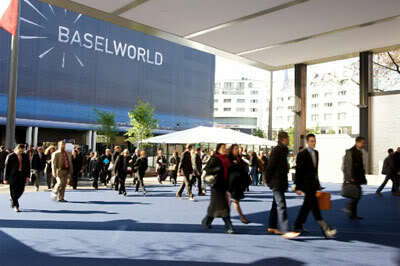 Let’s start straight away with one of the hottest brands of the moment: Bvlgari. Yes, the Italian Maison is a proper watchmaking expert and as a demonstration of this savoir-faire, it has created several record-breaking ultra-thin watches – the thinnest tourbillon, the thinnest minute repeater and here is the new thinnest automatic watch AND thinnest tourbillon ever. 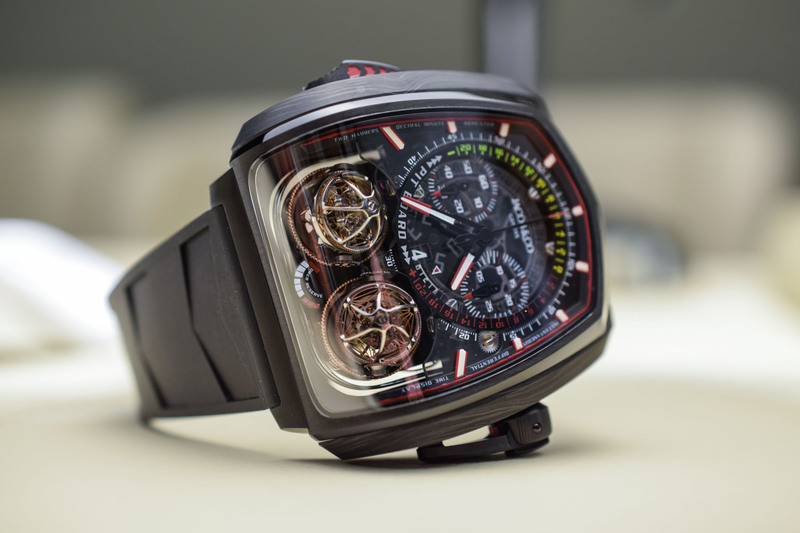 Its movement, an automatic tourbillon with a peripheral rotor, only measures 1.95mm in height (basically, thinner than a half dollar coin) and its case is 3.95mm. 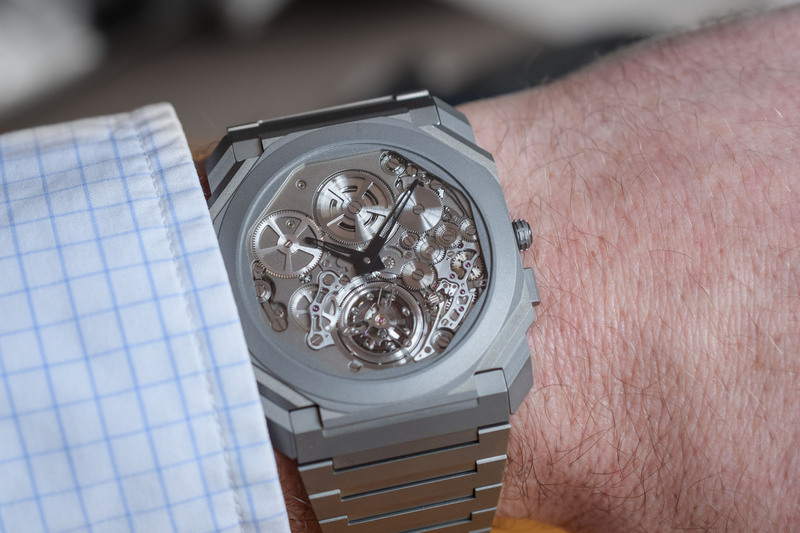 Yet, even with such thinness, the Bvlgari Octo Finissimo Tourbillon Automatic is far from being delicate and shy. 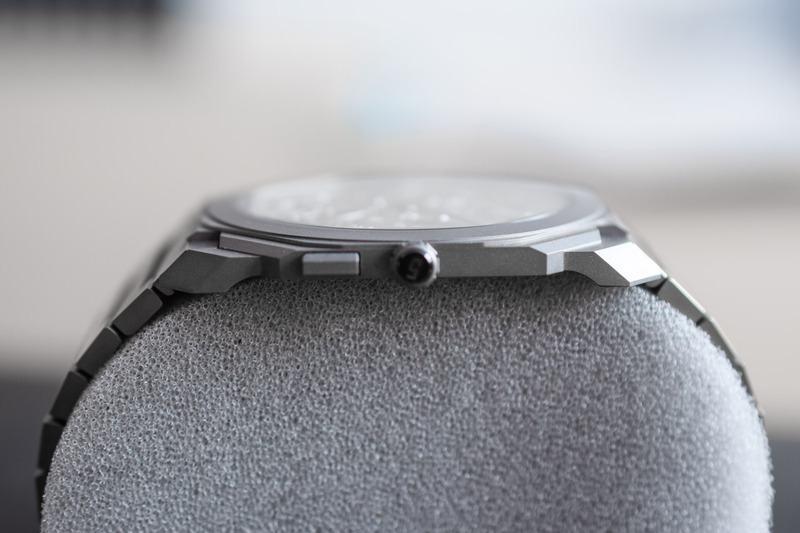 On the contrary, Bvlgari encases its movement in a bold, sharp and modern titanium case, for a virile, contemporary look. Simply staggering in terms of mechanical creativity and technical prowess. Quick facts: 42mm x 3.95mm titanium case – water-resistant to 30m – automatic movement BVL 288 with hours, minutes, small seconds and flying tourbillon – titanium bracelet – CHF 120,000 or EUR 125,000 – For more information, visit www.bulgari.com. 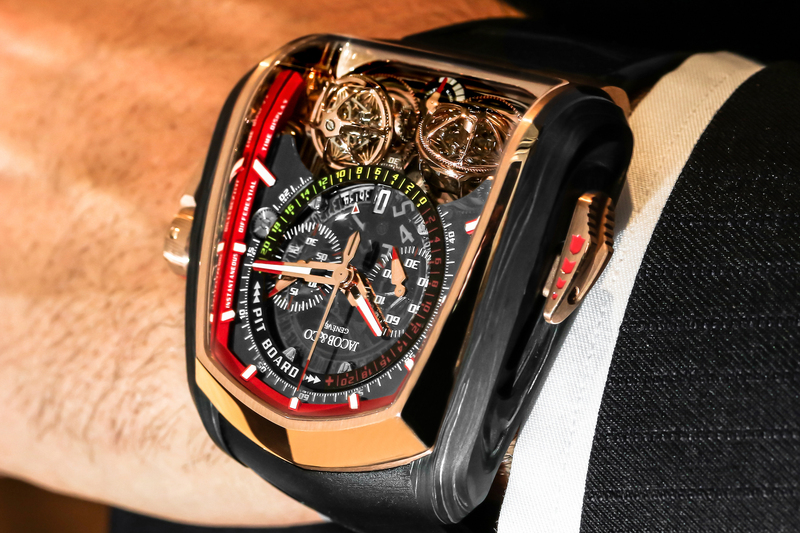 The triple axis tourbillon regulators rotate in 24, 8 and 30 seconds on their own axes, these are ultra-fast and truly spectacular, with their voluntarily jerky, high-speed motion. Like it or not in terms of design, but mechanically-speaking, the Twin-Turbo Furious is quite something! 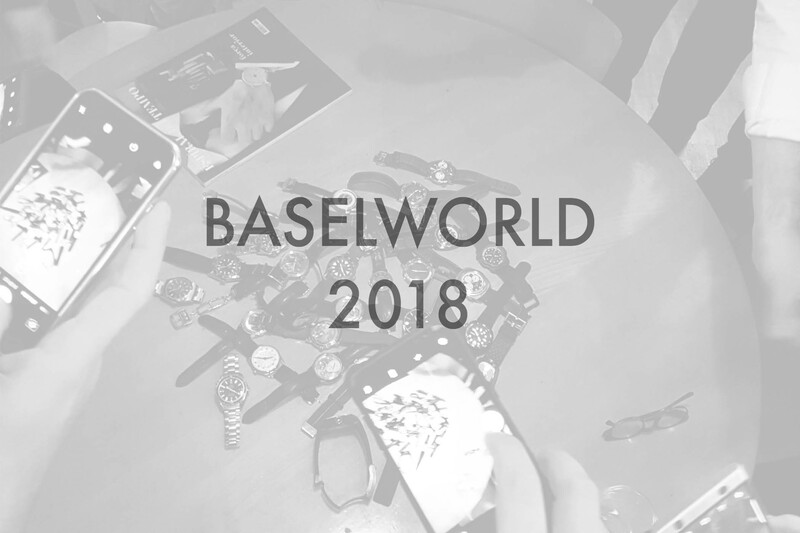 Quick facts: 57mm x 52mm x 17mm black DLC titanium and carbon fibre case – water-resistant to 30m – hand-wound movement JCFM05 with hours, minutes, small seconds, mono-pusher chronograph with ‘reference time indication’, decimal minute repeater, double triple axis tourbillon (rotation in 24, 8 and 30 seconds) and power reserve indicator – black leather strap with folding buckle – CHF 525,000 – For more information, visit www.jacobandco.com. We knew Jaquet Droz and its famous singing machines enlivened with automata – such as the Tropical Bird Repeater. Now we have the Jaquet Droz Signing Machine. Following the long tradition of automata that made the brand famous (with iconic automata such as The Writer, The Musician and The Draughtsman), JD presented a completely useless but utterly fascinating mechanical creation. Even if it has nothing to do with a timepiece, the way it works is basically the same, as it relies on gears, levers, pinions and wheels. Together, 585 mechanical parts operate within a complex mechanism that is entirely assembled and finished by hand. The programming of the signature – or the mechanical coding of its imprint over three cams – is also carried out entirely by hand. The signature reproduced by the Machine is, of course, unique and personal – and will be chosen by the future owner. 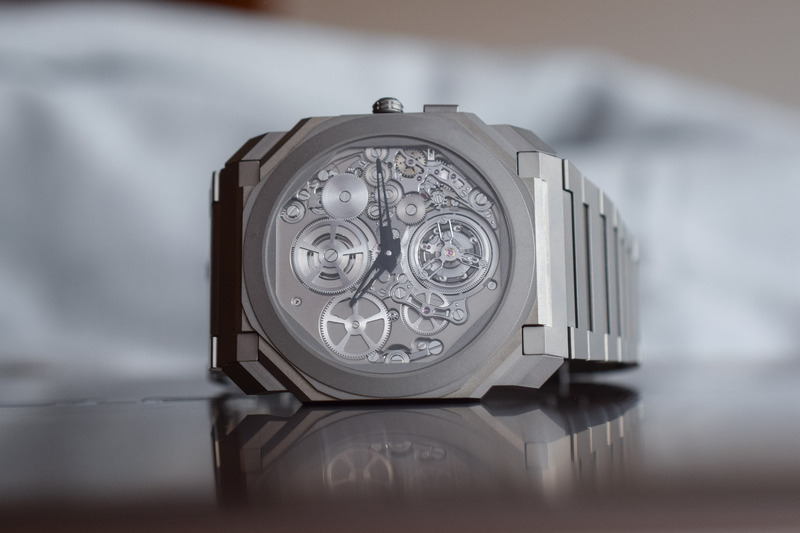 Quick facts: hand-polished and satin-brushed stainless steel case – power reserve indicator in an aperture – mechanical movement hand-wound by a sliding block, personalised signature locked by a 4-digit code – power reserve for 2 signatures – 8 jewels – Dimensions: 158mm x 82mm – Price: over EUR 300,000 – For more information, visit www.jaquet-droz.com. 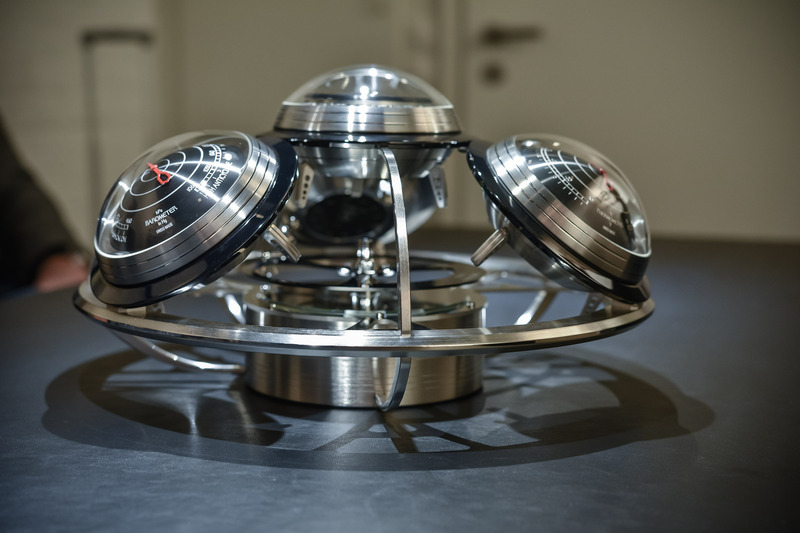 MB&F is known for the creation of extreme timepieces as well as slightly mad table clocks – see for instance Octopod or Balthazar. While the brand has ventured “out of the box” with these creations, this year it went a few steps further by looking at an outdated concept: the weather station. What is the point, when your iPhone can give you these indications in a real-time, precise way? Well, the beauty of “The Fifth Element” is the “why not?” mentality behind it. 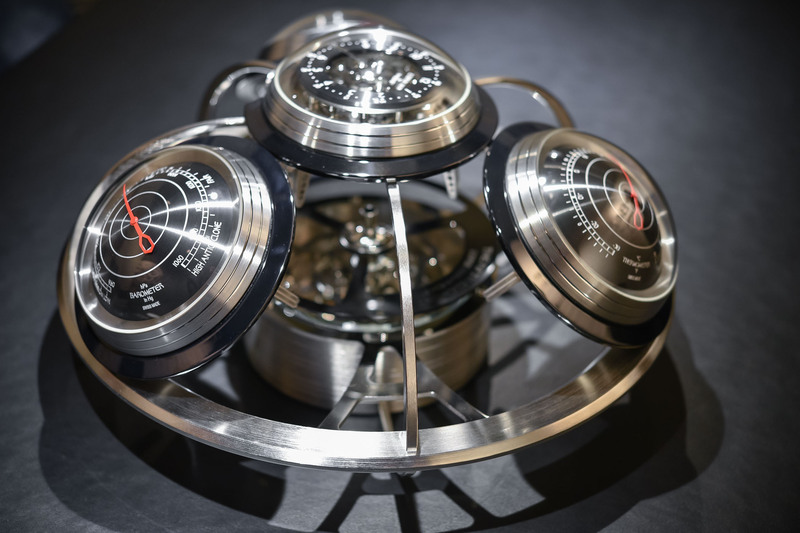 This entirely mechanical piece of creativity, which comprises four separate elements (a clock, a barometer, a hygrometer and a thermometer), is far from old school and could be qualified as an “intergalactic horological weather station”. Again, a nonsensical yet essential object with no other function than pleasure. 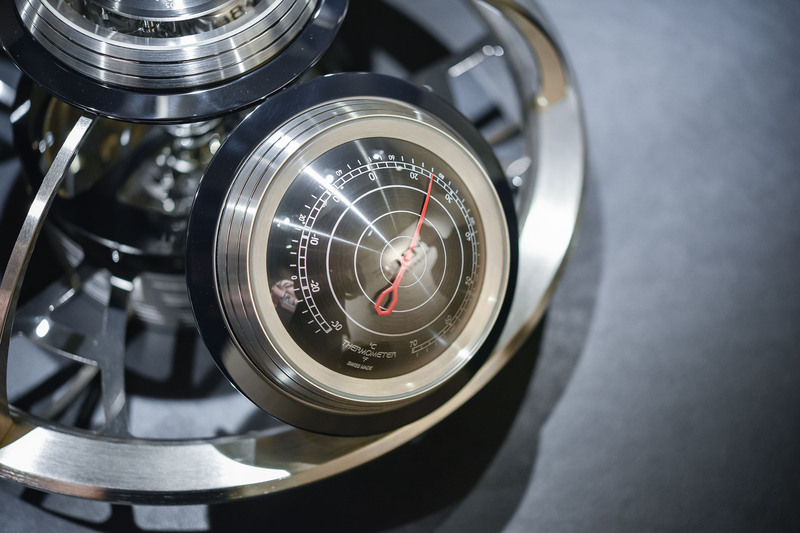 Quick facts: Indications/functions: clock (hours and minutes), barometer (air pressure), thermometer (air temperature), hygrometer (air humidity) – 376mm in diameter x 209mm in height – 531 components in steel, brass and bronze – 15kg – available in 3 colours – Clock movement by L’Epée: 124mm in diameter x 92mm in height – 2.5 Hz (18,000vph) frequency – 8-day power reserve, hand-wound – 161 components – CHF 52,000 (ex. taxes) – For more information, visit mbandf.com. 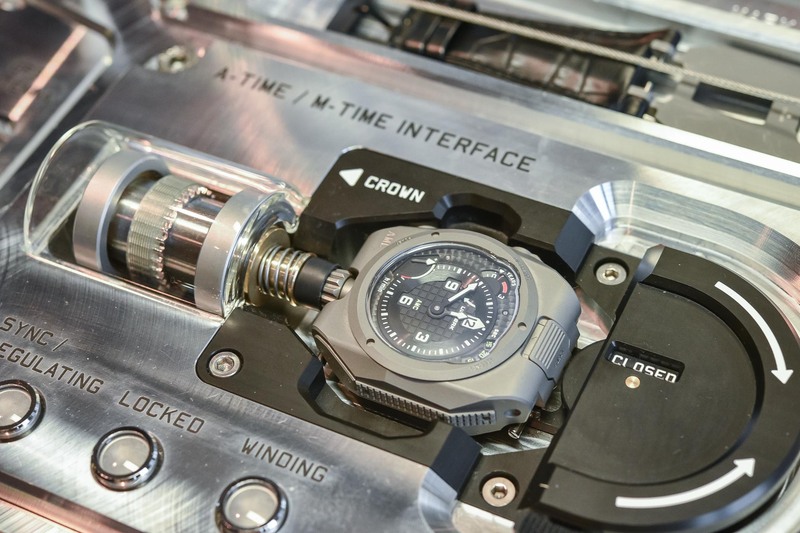 Most of us know URWERK for its ferociously modern watches with satellite display. 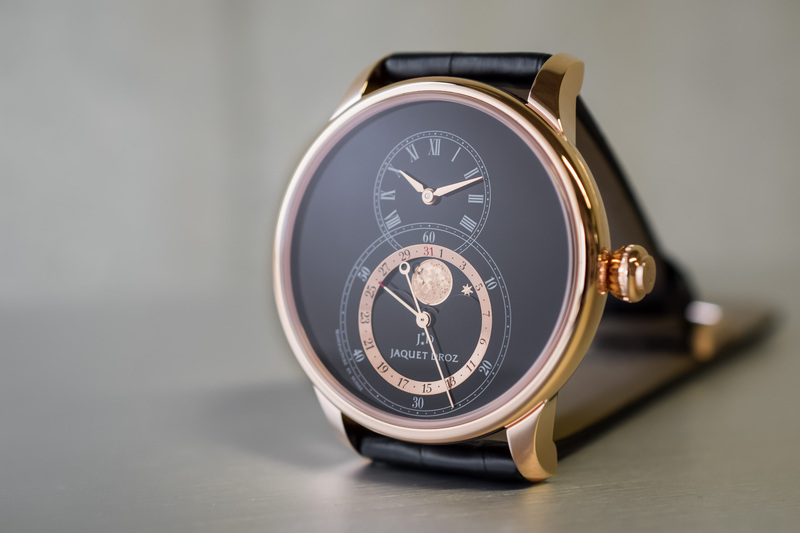 What is less known is the true fascination Frei and Baumgartner (the founders) have for watchmaking and history. So, what happens when you combine their creativity with the ancient concept of the Sympathique Clocks developed by Breguet? You end us with this: the URWERK AMC, a contemporary interpretation of Breguet’s concept where the base (the master clock) is none other than a proper atomic clock, which in turn is able to wind, adjust and regulate a wristwatch (the slave clock). 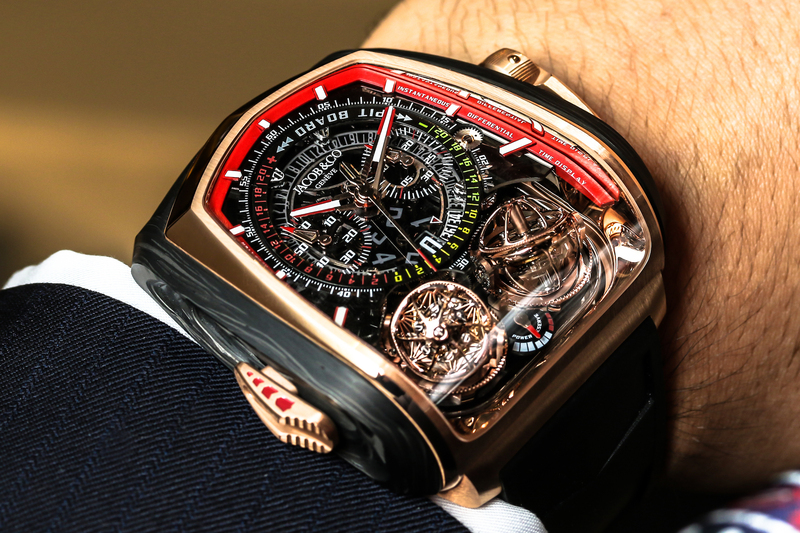 Of course, if the master clock isn’t mechanically regulated, the regulating and adjusting operations, as well as the watch, are purely mechanical. 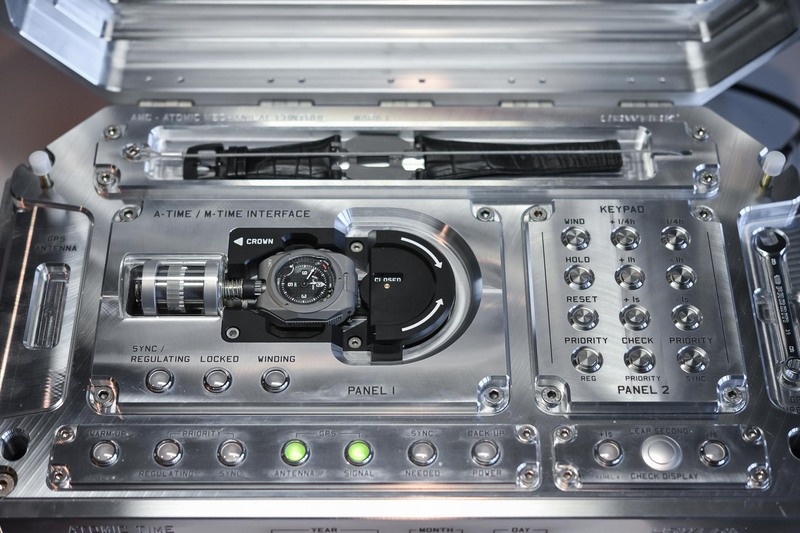 The mother clock is a spaceship-shaped block of aluminium measuring 45cm x 30cm x 18cm and the AMC atomic clock will keep nearly perfect time, guaranteed to within one second in 317 years. 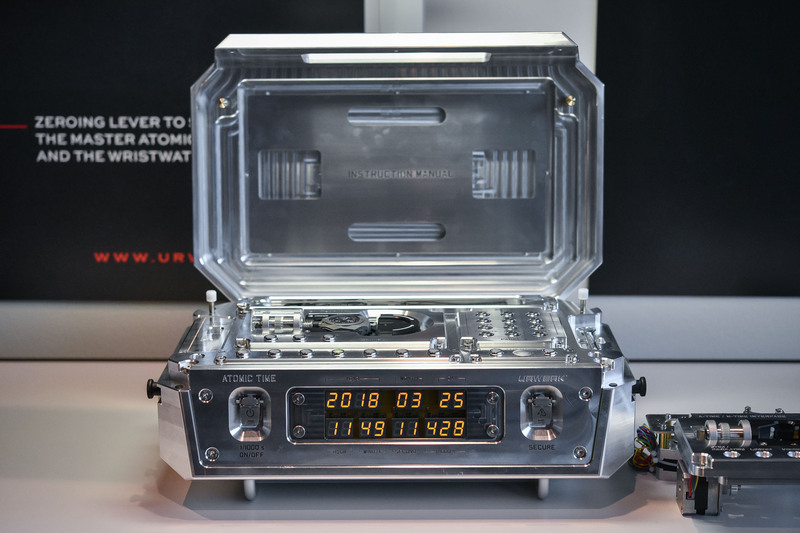 The master clock will rewind the URWERK wristwatch, set it to the correct time and if necessary adjust its rate – and all of that through a series of mechanical pins and triggers. Three pieces will be produced (incl. 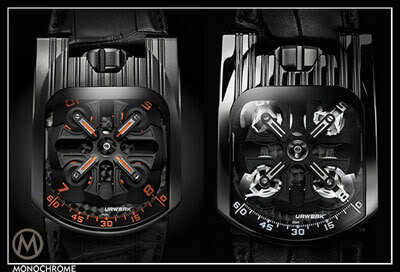 one for URWERK) with a retail price that will probably be over EUR 1,000,000. 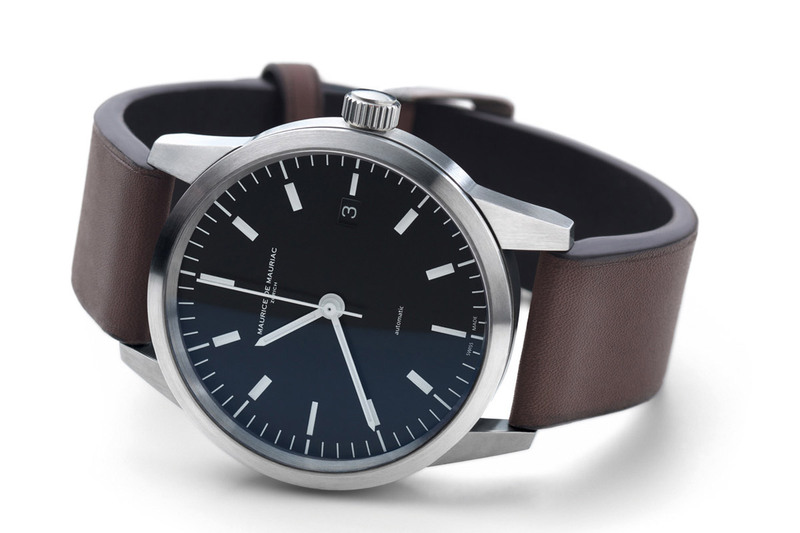 Quick facts: AMC watch: mechanical in-house movement, 4Hz frequency and 80h power reserve – seconds, minutes, hours, years – balance rate adjustment and synchronisation of minutes and seconds – Mother clock: YIG (yttrium iron garnet) and rubidium atomic clock – aluminum case, with cradle for watch – Indications: thousandth seconds; seconds, minutes, hours, day, month, year – Functions: manual winding of the AMC wristwatch, GPS synchronisation, setting time zones, setting leap second (+/-one-second adjustment), reset – For more information, visit www.urwerk.com.